See scan - perfect condition. 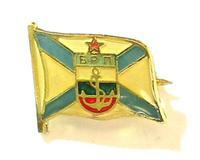 This is a nice and rare Communist era Bulgarian pin as presented to officer staff of the Danube River Fleet. The pin / badge shows the NAVY flag with Bulgarian colors and anchor in middle. Atop is a Red Star. Size is 15mm x 13mm. Rare marine / river fleet and nautical related collector piece and one of the rare Communist Bulgarian pins and badges.